Juliet Marillier is so very talented. The skill in which she crafts prose and weaves stories with such beauty is simply amazing. While I don't love all of her stories, for whatever reason (maybe a particular plot won't excite me, or maybe I can't relate to the main characters of a given story), the ones that I do love always blow me away. And, such was the case with Child of the Prophecy. Now, I've read the Sevenwaters books all out of order, mostly due to circumstantial reasons. At present, I'm mostly caught up, and after finishing Child of the Prophecy, I only have the novella Twixt Firelight and Water as well as the newest book Flame of the Sevenwaters left to go. 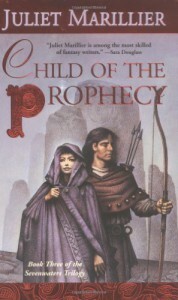 So, I have a lot to compare Child of the Prophecy to. Yet, the books holds up in the series, and has all of the elements that Marillier does best. Going into this book, I read all these reviews saying that Fianne was a great protagonist because of her capacity for evil. While I agree that she was a great protagonist, and was a lot more three-dimensional than some of Marillier's other leads (cough Liadan cough), I never thought of her as evil in any way. Yes, she did some horrible things, but I always understood and even sympathized with her reasons for doing them. Fianne's struggles throughout the book and the loneliness she is forced to endure is somewhat heartbreaking, and while I was reading this I yearned for her to somehow find happiness. The key to her happiness seems to be Darragh, Fianne's best friend from childhood who fell in love with her somewhere along the way. Fianne has to constantly push Darragh away to protect him from her wicked grandmother. Yet, even after being pushed away time after time, Darragh is always coming back to her, which just squished my heart in a painful but wonderful way. They are apart for most of the book, but that just makes the moments they have together all the more poignant and beautiful, even when (especially when) those moments were heartbreaking. I will say that there are parts of this book that are a bit slow, and this book is a bit too chock full of lore and information on the events of Sevenwaters. Overall, though, this was a wonderful story, the kind that made me ache, and those who love Marillier's works should love this one as well.